Almond and coffee come together in perfect harmony in the popular cocktail known as the toasted almond. This incredibly easy drink is a delicious delight and, if you want to kick it up a notch, add a shot of vodka to create a roasted toasted almond. Either of these delicious cocktails is a perfect way to shake up your white Russian routine. The mix is very simple, using amaretto and coffee liqueurs against a creamy base. It's irresistible and ideal for those times when you want a quick and satisfying drink. The gentler of the two mixed drinks, the toasted almond is a pleasant sipper for those times when you want a good drink that is light on the booze. It makes an excellent dessert drink as well and you can serve it "up" in a cocktail glass for a gentle, creamy martini. Pour the liqueurs and cream into a cocktail shaker with ice. Shake very well for at least 15 seconds to ensure everything's mixed and the cream becomes frothy. An equal pour of the two liqueurs is common, though the cream can vary from 1 to 2 ounces. Feel free to adjust the proportions of any ingredient to suit your personal taste. Though you may be tempted to simply pour and stir this drink in the glass, the shaking really does make a better cocktail. The agitation and dilution will soften up the heaviness of the cream and give the drink a frothy lightness that's much more enjoyable to drink. The choice between milk and cream is up to you and each will produce a slightly different drink. Milk will create a lighter drink than cream. However, it's best not to use a milk lighter than 1 percent because of the dilution from shaking. If you pour skim milk, you will lose some of the richness and the drink will seem watered down. There are a number of cream options as well. A heavy whipping cream is almost too thick and will create a richer toasted almond than one with regular cream. For a nice balance between the two extremes, half and half is a perfect option and a great cream for most cocktails. Alternatively, any of the milk alternatives should make an excellent toasted almond. Try it with soy, almond, or any other milk substitute; almond milk would be a natural choice because it will complement the amaretto perfectly. The roasted toasted almond (or burnt almond ) is "roasted" by adding vodka to the mix. 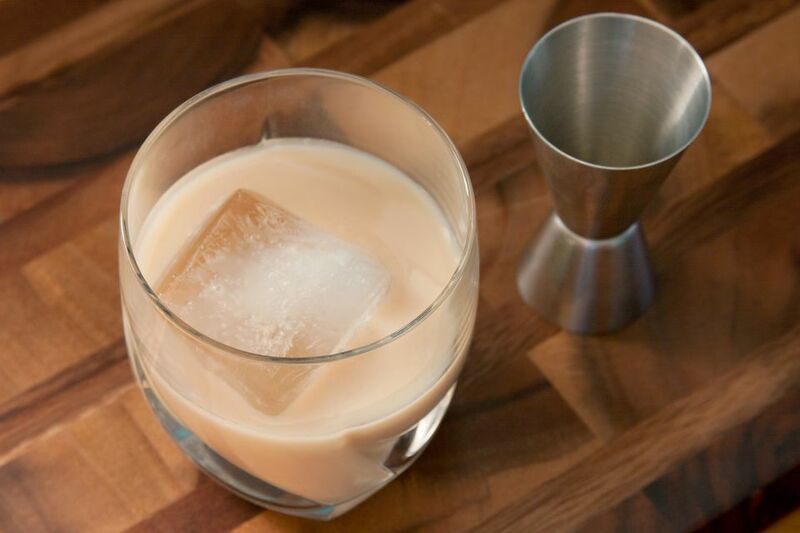 To make this drink, build 1 ounce each of vodka, coffee liqueur, and amaretto in an old-fashioned glass filled with ice. Fill with milk or cream. Shake by placing a mixing tin over the glass and give it one or two good shakes. This is also a perfect candidate for flavored vodka. An espresso vodka is a perfect choice and adds an extra coffee kick to the drink. It's also easy to make your own coffee-infused vodka—simply follow the steps in this coffee bourbon recipe. Other good options include chocolate and amaretto or any of the whipped cream or cake-flavored vodkas. How Strong Is This Drink? As you might imagine, the roasted recipe is slightly stronger than the toasted almond, though both are relatively tame in the cocktail world. Using a 42-proof amaretto and 40-proof coffee liqueur, the alcohol content toasted almond averages out to 14 percent ABV (28 proof). Adding half a shot of 80-proof vodka creates a roasted toasted almond of about 18 percent ABV (36 proof). While the vodka doesn't make too big of a difference, it is a nice way to add an extra punch to the drink without getting out of control.